Easy step by step guide on how to troubleshoot and repair an automotive engine cylinder misfire P0300, P0301, P0302, P0303, P0304, P0305, P0306, P0307 and P0308, though appearances may vary, the process is similar for most vehicles. Begin with the vehicle on level ground engine "OFF" and the parking brake set, wear protective gloves and clothing for safety. 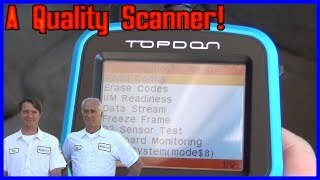 Step 1 - There are several combinations of misfire conditions, steady or random, at idle or under power, which may or may not be detected by the computer and trigger a check engine or service engine soon light, read trouble codes to help pinpoint the cylinder(s) in question and follow the repair guide below. 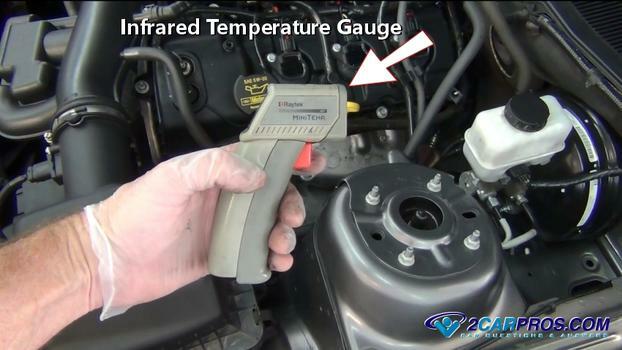 Step 2 - If no service light is triggered with a steady misfire, use an infrared thermo gun to test the exhaust temperature of each cylinder. Step 3 - Start the engine cold, quickly take a reading at the front of each cylinder's exhaust port on the manifold while maintaining similar placement of the beam over each individual port, a misfiring cylinder will be considerably colder than the remaining cylinders. Example: Three of the exhaust ports test at 190 degrees while one is at 81 degrees, the cylinder at 81 degrees is misfiring. 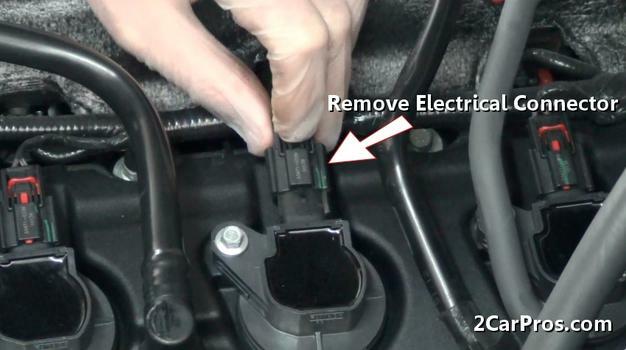 Step 4 - If no results are yet gleaned, start the engine and allow to idle, remove the fuel injector electrical connector on each cylinder one at a time while observing the engine performance, if no change is observed at a particular cylinder, the misfiring cylinder has been located. Step 5 - This can also be achieved by removing a coil wire connector (COP systems only - no plug wire attached ). 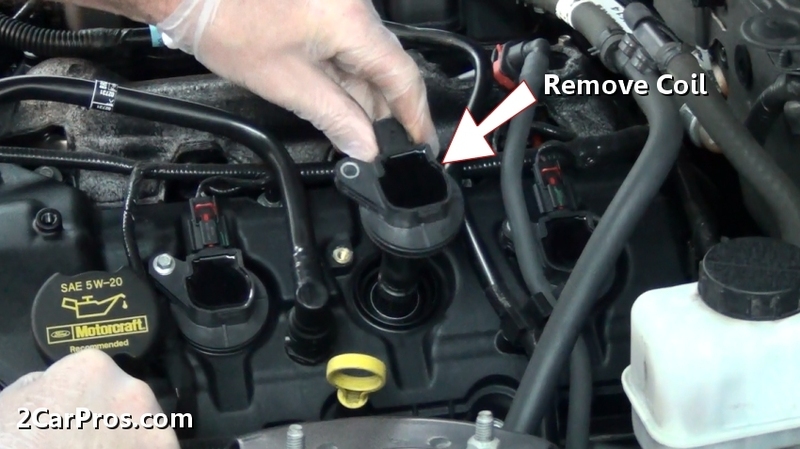 Step 6 - Once the misfiring cylinder has been located, remove the spark plug for inspection, before removing the spark plugs, mark the plug wires (if equipped) to identify their positions in the firing order, this will help for proper reassembly. 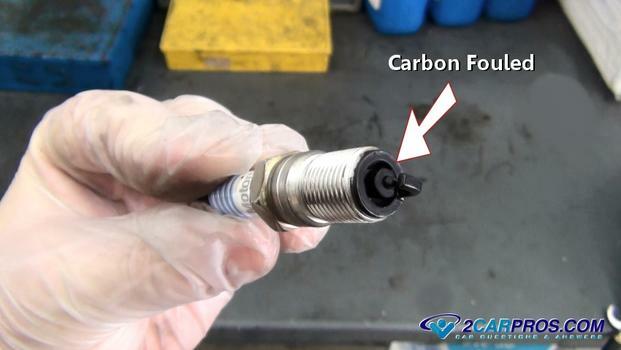 Step 7 - When a cylinder(s) runs rich it will carbon foul the spark plug causing it to short circuit. 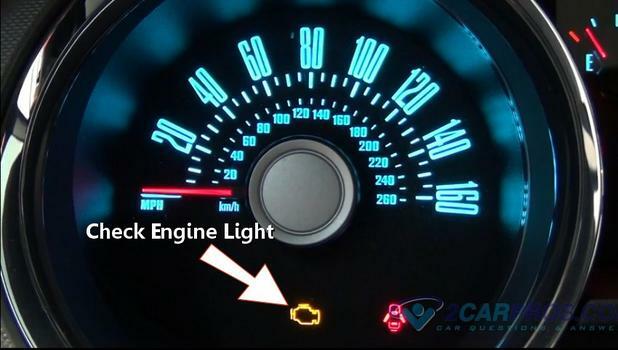 Malfunctions for this condition include partially plugged fuel injector or catalytic converter, low compression, failed fuel pressure regulator and excessive fuel mixture. 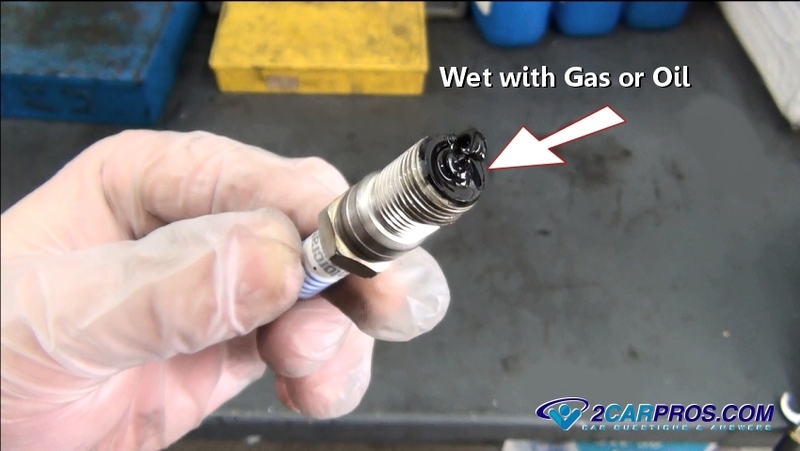 Step 8 - A wet spark plug with gas or oil can mean a fuel injector is stuck open, fuel regulator has failed, no cylinder compression, broken piston oil control ring, blown head gasket or excessive leakage from the valve stem seals. 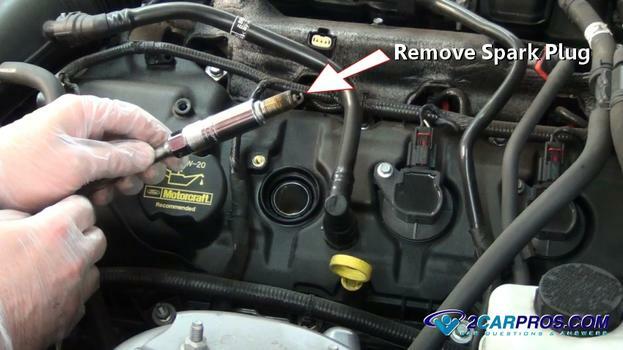 Step 9 - A spark plug must be properly gapped with a specific measurement from the electrode, a misadjusted air gap can result in a misfire. 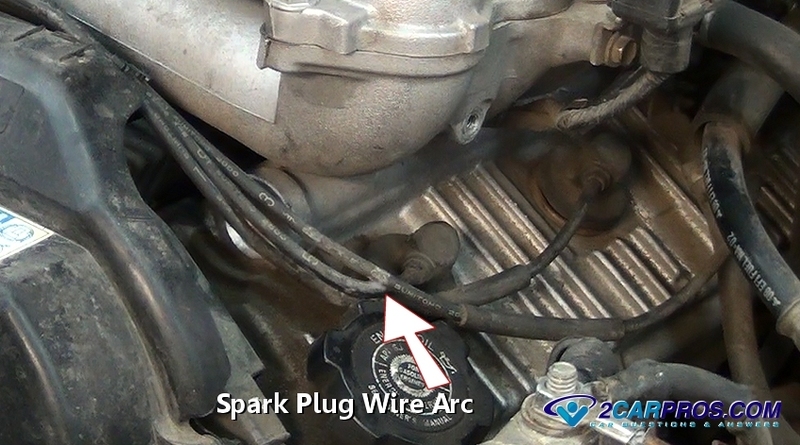 Step 10 - Using a proper spark plug with a correct air gap will help ensure operation of the ignition system. Step 11 - If the spark plug is wet with fuel or carbon fouled upon removal, a compression check is needed, perform a cylinder compression test to locate a mechanical failure. 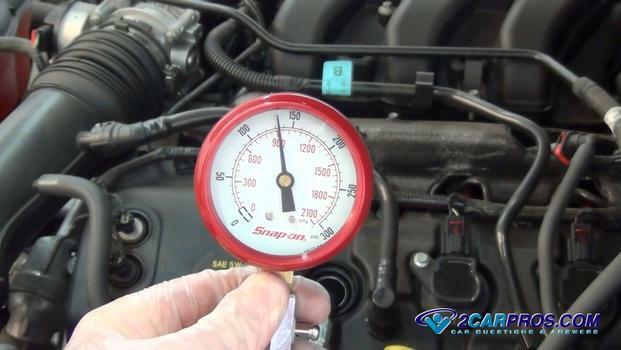 If compression is low, it could mean worn out or broken piston rings, flat camshaft, broken valve spring, burnt or leaking intake or exhaust valves, dropped valve seat or blown head gasket. 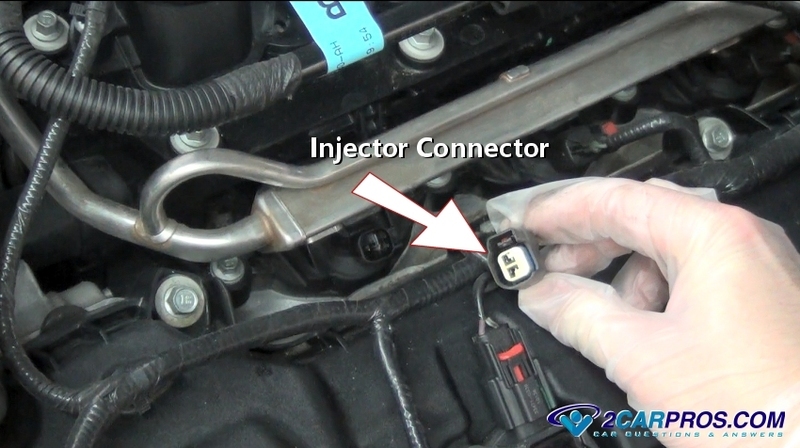 Step 12 - If the compression test is okay along with a wet spark plug, the ignition coil needs to be tested. Step 13 - Spark plug wires are designed to transfer an electrical charge from the coil to the spark plug, when these cables wear, they can short circuit causing a misfire. 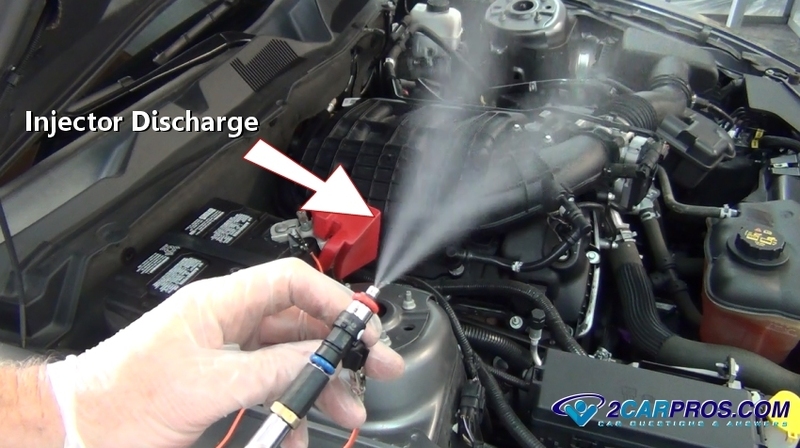 Step 14 - A fuel injector regulates the amount of fuel which is consumed by the engine, if the injector operation has failed the cylinder will misfire. 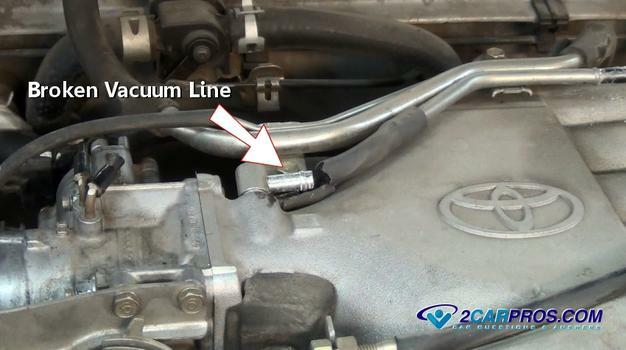 Step 15 - A random misfire is can be associated with broken or dilapidated vacuum hoses or tubes on and around the engine causing a vacuum leak, these hoses are typically connected to the engine intake manifold and supply engine vacuum to various accessories such as the brake system. 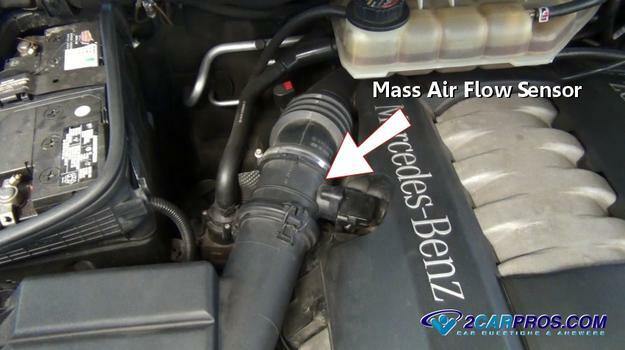 If an intake gasket fails or a vacuum line that is close to an intake port it will cause a steady misfire. 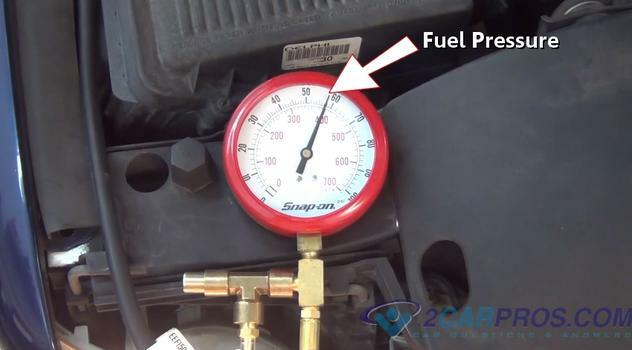 Step 16 - Fuel pressure must maintain a constant pressure, if this flow is impeded by a clogged fuel filter or weak fuel pump the engine can produce a random misfire. Step 17 - A mass air flow sensor sends feedback information to the computer, as this sensor wears it can produce false data causing a misfire. 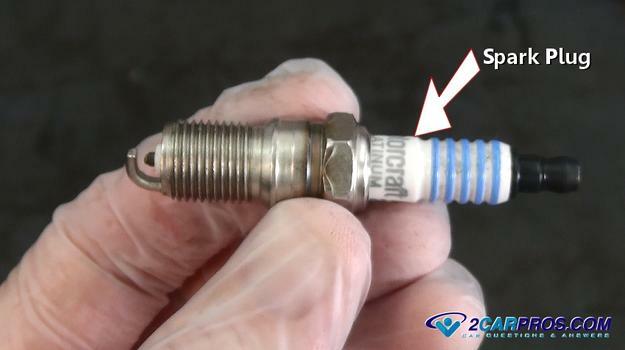 Step 18 - Each intake and exhaust valve utilizes a spring which will return the valve to its original position (closed). If a valve spring has broken or a cam lobe has worn down, it will cause the engine to misfire and run rough due to the loss of compression. 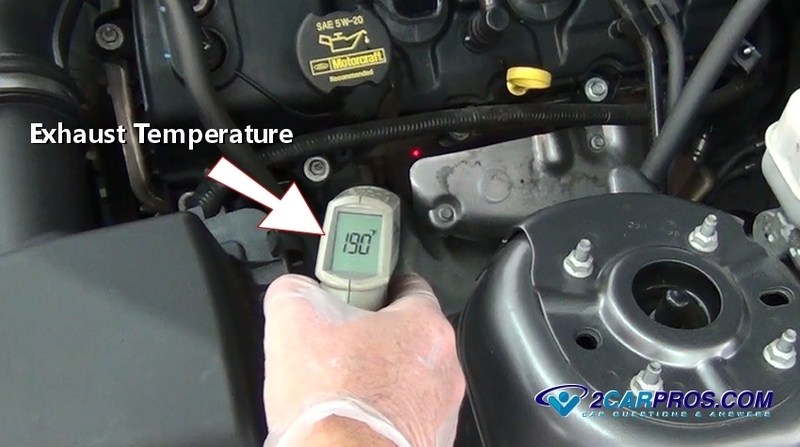 These conditions don't always show up in a compression test, because a compression test is performed at engine cranking speed. 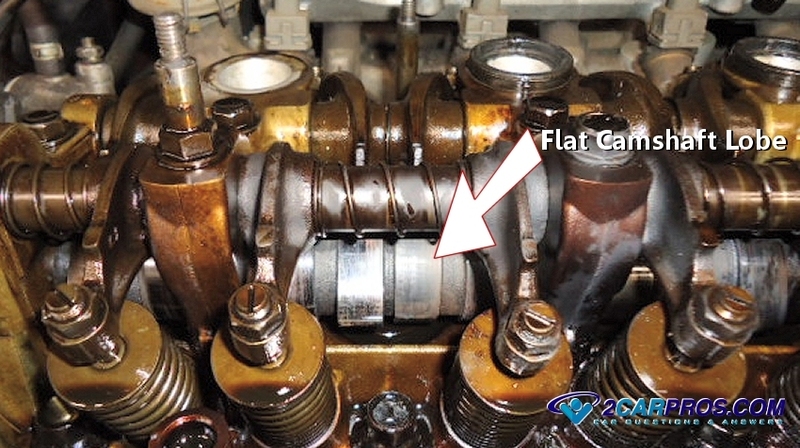 If a camshaft lobe is halfway worn down, it will show up only when the engine is running and under load. 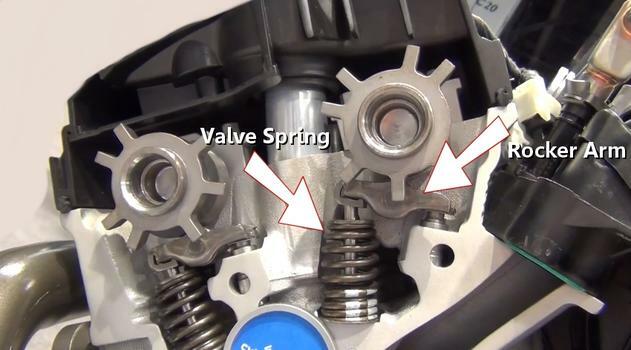 Step 19 - In some conditions a broken valve spring can effect different aspects of engine performance for example: If just a small part of a coil breaks off, the spring can still close the valve but only at low RPM's, causing a high RPM misfire. If the spring breaks somewhere in the middle it will affect both idle and power conditions. To test for this condition, remove ignition coil connector or ignition system or fuel pump fuse to disable the engine from starting. Remove valve cover(s) to gain access to visually inspect the valve train. 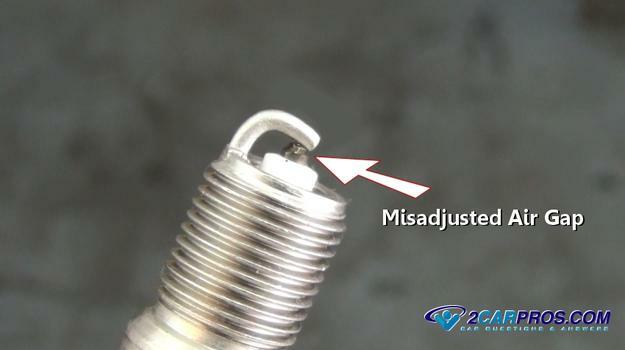 Inspect the condition of the valve springs, use a flashlight and small mirror to aid in the inspection. Have a helper crank the engine over while observing rocker arms and cam lobes, confirming full movement, if one or more lobes are traveling less than the others the camshaft has a flattened lobe and replacement is required. Step 20 - A head gasket is used to seal the cylinder head to the engine block. The cylinder head is fastened to the engine block using head bolts that are tightened to a specific torque. When a head gasket wears (blows) it can allow coolant or exhaust gasses to enter the combustion chamber causing a cylinder misfire. An engine tune up is necessary at manufacturers recommended intervals to maintain proper engine run-ability. A misfiring engine will cause, low gas mileage, low power output, increased emissions and possible internal engine damage if left untreated. Typically an engine misfire under load, will be a problem with the ignition system, while low engine speed problems will be a vacuum, fuel management or compression issue. 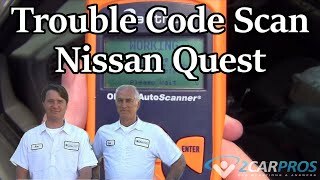 When retrieving trouble codes, only consider related codes to a specific misfire problem, like an ignition coil failure code. If a trouble code is present and doesn't pertain to the immediate problem like an EVAP code, ignore it until a later time, when the engine is running properly these codes could cycle out.